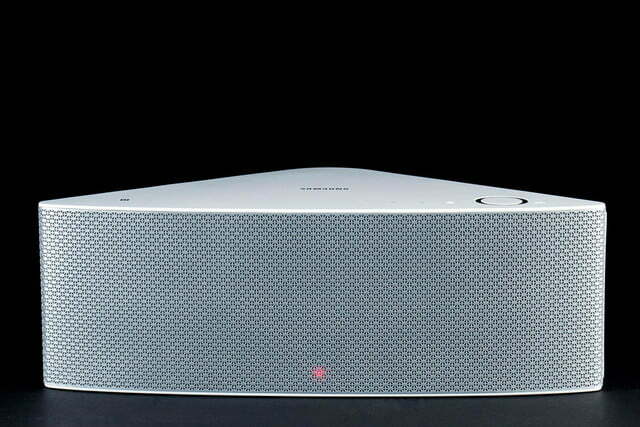 Samsung’s first effort at a wireless audio ecosystem is a respectable one, but it is not a Sonos killer. A few weeks ago we evaluated the Sonos Play:1 speaker system, the latest and most cost-effective member of the Sonos family. True to Sonos’ form, The Play:1 provided a worthy audio performance on top of what we called “a unique and immersive wireless experience.” Of course, nothing stays unique in the tech world for long. It seems the folks at Samsung felt like giving Sonos a run for its money, because it has developed a wireless audio ecosystem that is eerily similar to Sonos’ design. Riffing off of someone else’s good idea is not a new practice in the technology space, and, in fact, several others have attempted to dethrone Sonos as the wireless audio king over the past few years. But Samsung has a knack for playing off of a good thing while also adding its own spin, often bringing cool new evolutions to the table. 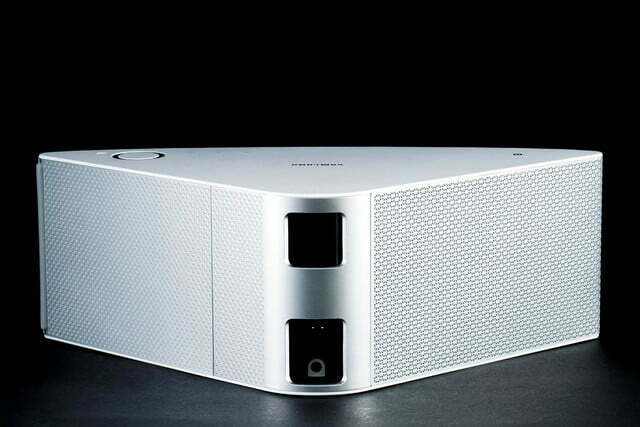 And that’s exactly what it’s done with its new Shape M7 wireless speaker system. The M7 system includes virtually every feature of Sonos’ clever ecosystem, while adding some new twists to the infrastructure, Bluetooth streaming, NFC pairing, and more. 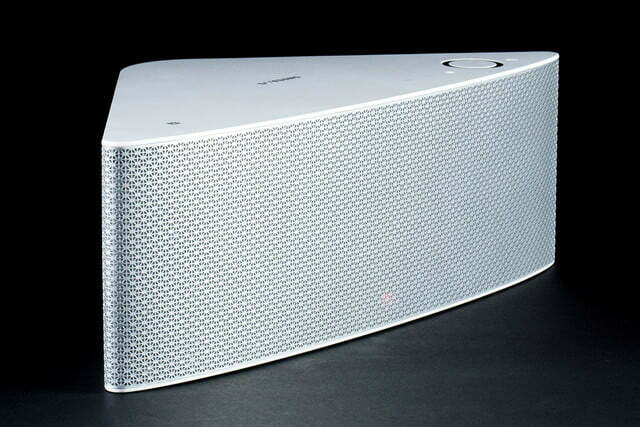 With its larger size and $400 price tag, the M7 targets Sonos’ larger and more expensive Play:3 or Play:5 speakers. We spent some quality time with a pair of the triangular M7’s to find out how well Samsung’s new system performs and, more importantly, how its first go at a wireless speaker sounds. For the full verdict, read on below. 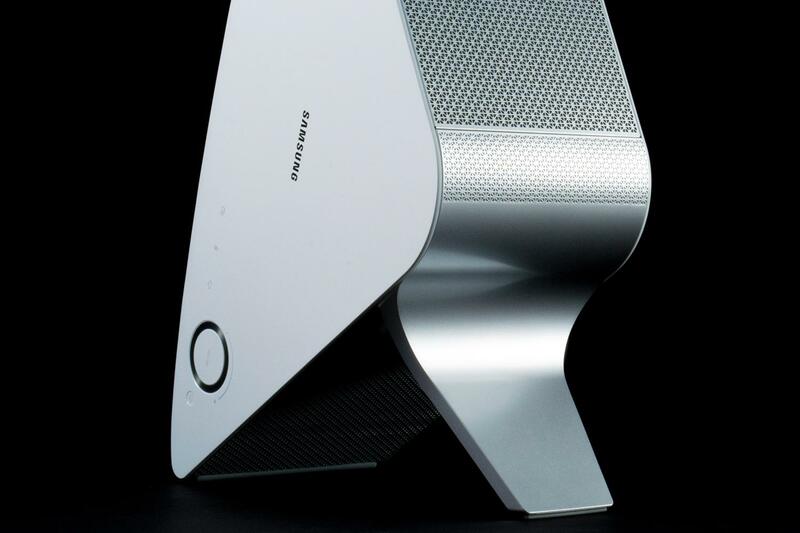 Samsung sent a pair of M7 speakers, each sheathed in a glossy hard shell cover – one ebony, the other ivory – and outlined with a futuristic diamond netting of plastic. The trilateral blocks were heavy (10.9 lbs) as we hoisted them up, and they looked right at home with today’s minimalist speaker designs, striking a balance between classic elegance and modern swank. The top of each speaker bears a small selection of touch capacitive symbols below a mirrored surface as well as an NFC touch point, a mute/power cycle key, and a digital volume knob ringed in silver. Removing the plate that covered the back corner revealed a small selection of ports including a power cable input, a 3.5mm Aux input, an Ethernet port, and a USB service port. Also in the chamber was a pair of small buttons labeled Wi-Fi Setup, and Speaker Add. A small mounting stand inside each box is designed to replace a plate at the back of the speaker to allow for mounting the M7 vertically. Rubber pads around the bottom panel provide secure footing for horizontal play. Aside from the stand, each box also contained a pair of instructions, Ethernet and power cables, and a ferrite bead to minimize electromagnetic interference introduced through the power cable. 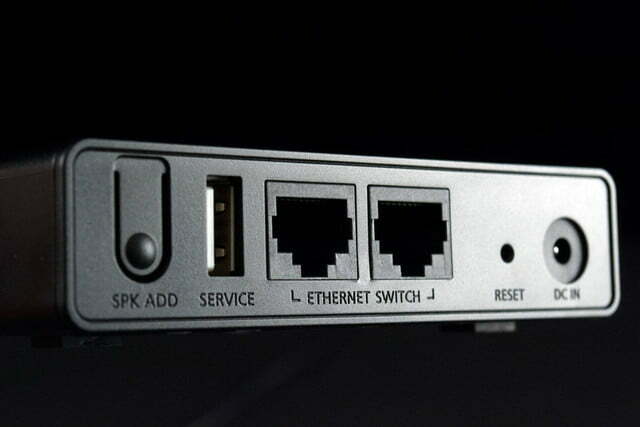 Inside a separate black box was a plain looking routing hub (which we would later use to link up speakers into a wireless ecosystem), an Ethernet cable and power cord. While Samsung’s M7 is a wireless ecosystem that bears several similarities to that of Sonos’, its new toy offers even more ways to connect, including Bluetooth, and a 3.5mm Aux input. 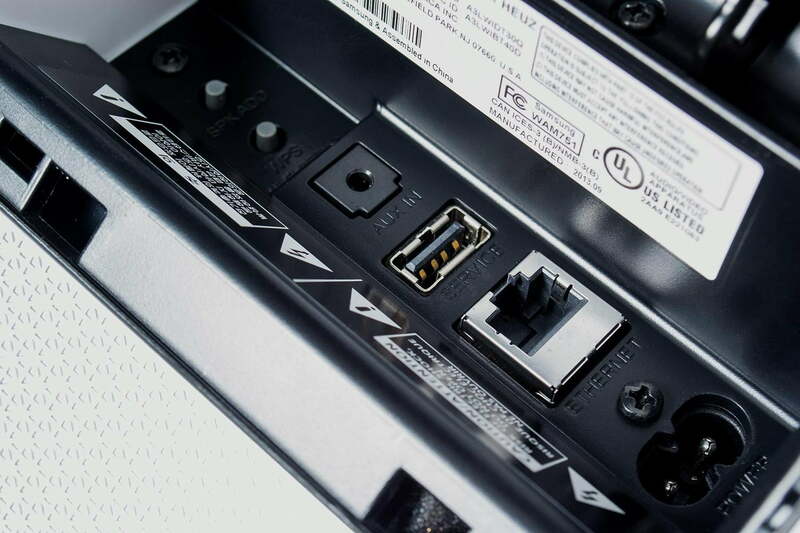 However, concealing the ports at the back, as Samsung has done here, makes any hardwire connection – even the power cable – a bit tedious, especially when using the snap-on mounting stand. Another notable inclusion is the M7’s ability to connect to Wi-Fi without using the separate hub, a coup over Sonos’ individual speakers which must be hardwired to connect to a network autonomously. Sandwiched between the M7’s gleaming outer shell is a collection of five active drivers, boasting a foam core 4-inch woofer at the center flanked by a pair of 2.2-inch CNT (that stands for Carbon Nano Tubes; no kidding) pulp cone midrange drivers, and two 3/4-inch silk tweeters at the corners. Compatible file formats include WAV, MP3 (up to 320 kbps), FLAC (up to 44.1 kHz/16 bit), WMA, and OGG. The speaker will also play AAC files, but only if they are DRM free. If you’re familiar with the Sonos wireless ecosystem, then you’re already familiar with almost everything the M7 can do and could skip ahead three paragraphs. If not, here’s how this genre of wireless speakers works. 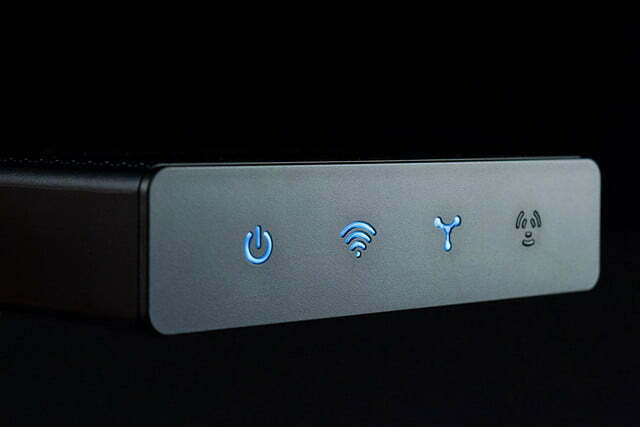 While a single M7 speaker can stream music over Wi-Fi, linking multiple speakers requires a $50 wireless hub (sold separately), which connects to your router via an Ethernet cable. Once plugged into a power source, the speakers automatically locate the hub and make their connection, indicated by a pleasant chime. From there, they become extremely versatile. The more speakers you add, the more options you get as you build your own modular network. Samsung’s… new toy offers even more ways to connect, including Bluetooth, and a 3.5mm Aux input. 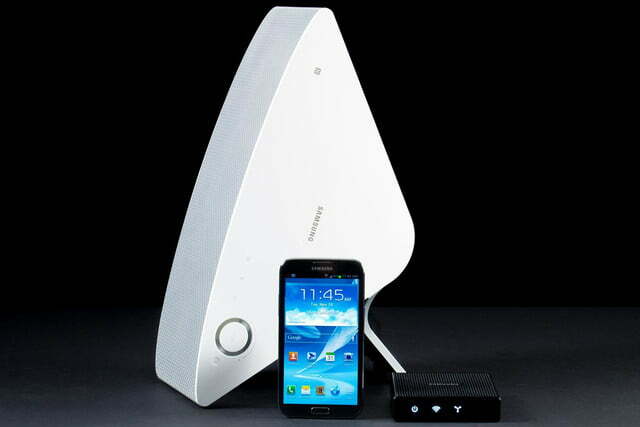 The network of speakers is controlled via an Android or iOS app called the Samsung Multiroom app. Using the app, you can connect two speakers together in stereo pairs, group multiple speakers together to play the same sound source throughout the house with zero latency, or break the groups up and play different music on each speaker from multiple sound sources. You can name each speaker or group from a selection of template names, or make up your own. Any change you make on a connected device seamlessly updates the remaining devices in the ecosystem. Available music sources include music stored on any connected device running the Multiroom app, such as our iPhone 5 and the Galaxy Note II Samsung provided us for our evaluation. You can also play music from any networked computer, but the files must be uploaded onto Samsung Link, which is PC compatible only. The Multiroom app is also stocked with TuneIn Radio, Pandora, Rhapsody, and Amazon Cloud Player, with other services likely forthcoming. Other adaptable features include individual muting and volume control of each speaker, EQ control, and the ability to create playlists. Ok, so that’s all the mirror image stuff. 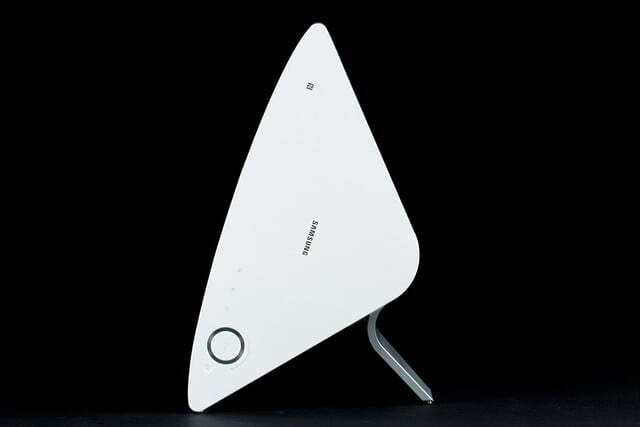 But there are also some cool innovations Samsung adds to Sonos’ template. The first is the Stereo Pair button, which allows instant pairing of a group, and channel flipping with a quick touch, as opposed to going into the Settings on the Sonos app. You can also drag and drop a song that’s playing to any of the speakers on the system, or drag them into a playlist. The system also accesses the music on your phone or connected device more like iTunes, allowing you to quickly choose music by song, artist, album, etc. With Sonos, you must load music into the queue first, which takes some time. On the flip side, Samsung’s version felt choppy and less responsive than Sonos’ streamlined queue system. Songs tended to load slower, and the app froze occasionally when we threw curve balls like playing from TuneIn Radio on one speaker while switching the other to our music catalog. The system also had some strange quirks, like the inability to locate all of the Artists on our iPhone 5 from the iPhone 5. Ironically, they were there when we accessed them through the Note II. Switching songs also caused a delay every time, and with stereo pairs the music would linger in one speaker before loading the next song, which became annoying. Aside from the buggier performance, the most notable difference in Samsung’s system was the fact that we were unable to use our phone for other Internet tasks while playing music from its library, a feature we loved about the Sonos design. The M7 definitely offers some admirable sonic traits. Its treble is light and precise, able to flesh out upper register strings, cymbals, and synthesizers with solid clarity. The lower register also performed admirably for the M7’s size, reaching down to the beef of hip-hop grooves, though we wished it was more firm and less boom-y. The midrange, however, left a lot to be desired, ranging from cloudy and flat on some tracks, to light and watery on others. And while the overall sound was generally clear and got the job done, we never heard the kind of definition or finesse we look for in a speaker at this price. The M7 definitely offers some admirable sonic traits. Our favorite tracks were lighter pop numbers, like those from Keane’s Hopes and Fears LP. The track “Sunshine” showed off that sparkling treble region, rendering a pristine flush from the cymbals and laser sharp lines from the layered keyboards up top. The speaker’s stereo separation proved wider than it looked, and we also got our first glimpse of the sheer power of the M7 here, which was more than boisterous enough below the halfway point on the volume dial to give warning. But we also had trouble finding a sweet spot in the volume, finding the increments moved too widely from one level to the next, always a bit too soft or too loud. As we made our way through our music catalog and a couple of hours of BBC 6 over TuneIn Radio, we continued to enjoy the thump of the bass, and the general “big sound” the speaker was able to reproduce. Moved to the background, the speakers provided a pleasant ambience. But while paying attention and auditioning our most complex tracks, we found ourselves wishing for more detail and dimension. The little subtleties of vocal effects like phase and reverb seemed to fall into the background, and the distinct sounds of a drummer’s snare and toms weren’t displayed with the rich textures and nuances that would draw us in for a deeper level of enjoyment. Standing the speakers up on their hind legs like a couple of spaceship afterburners, we spent a few hours listening to them as a stereo pair, which brought forth clear reproductions, and a rather massive wall of sound. We had an especially good listen to the Black Keys’ “Gold On the Ceiling,” a favorite for our test sessions. The twin speakers carved out the sawtooth grit of the fuzz bass and Moog synthesizers well, and the song sounded almost as big as we’d expect from a full-sized pair of towers. Still, we couldn’t coax forth the depth we craved from $800 worth of gear, and the percussion continued to be a telltale sign that our ears were riding above the deeper layers of the sound. Some publications have gone so far as to suggest the Samsung Shape M7 could be a “Sonos killer,” and with the Samsung name involved, it’s likely to offer some serious competition. However, while Samsung’s project is a formidable new opponent, we’d still choose two Sonos Play:1’s over a single M7. For the same price, the Sonos starter pair offers more options, a smoother ecosystem, and, with the exception of bass response, superior audio performance. 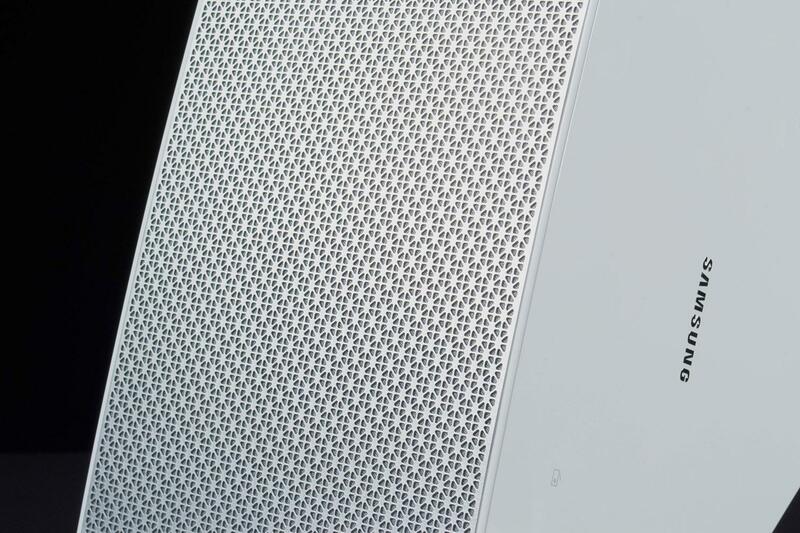 And if we were going to blow $800, we’d probably look to a pair of Sonos Play:5’s instead. The M7 is a respectable first outing, and we expect it to only improve from here. 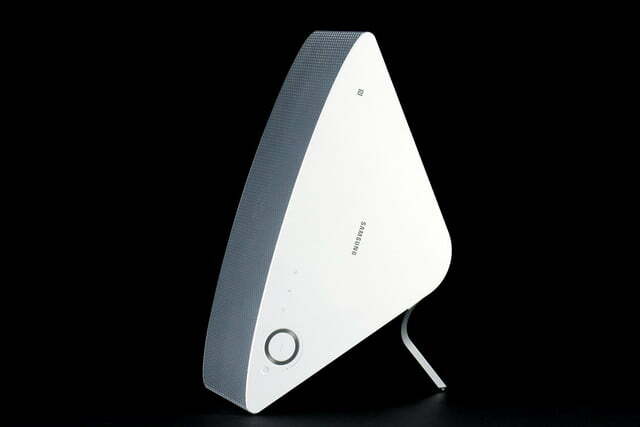 But in our book, Sonos is still king of the modular wireless world.